Only available as part of The Alien Quadrilogy. Note that this review of Alien Resurrection includes some elements that might be regarded as spoilers. I tried to keep these fairly vague, but they do spill a few beans. If you don’t want to know about those bits, skip to the technical portion of the article. Are 1992's Alien 3 and 1997's Alien Resurrection on a par with the first two films, 1979's Alien and 1986's Aliens? No, they aren't, but how many movies are? Those are two of acknowledged classics; movies like that don't come along every day. Both Alien3 and Resurrection are actually very good pictures; their main sins are that they aren't quite as revolutionary as their predecessors. The comments above address the original theatrical cut of Alien Resurrection. This DVD release also includes an extended “special edition” version of the film. It expands the original’s 109 minute running time up to 116 minutes. Most of this comes via short additions to existing scenes. The majority of the additions occur during the first act, though a fair number of extended bits occur in the film’s final third; only the second act proceeds pretty much as original displayed. We get an alternate opening that does nothing other than to begin the film on an oddly comic note, and we get a darker ending as well. The extra segments flesh out the film moderately, but they don’t make it a different experience. Detractors who hope the changes will significantly alter the flick will leave disappointed. I prefer the alternate ending, though, and I think the variations improve the movie slightly. I could live without the silly opening, but even so, this is the version I plan to watch in the future. 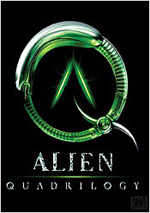 Alien Resurrection appears in an aspect ratio of 2.35:1 on this single-sided, dual-layered DVD; the image has been enhanced for 16X9 televisions. Given its status as the most recent Alien flick, I expected Resurrection to present a positive picture, and it delivered. Across the board, sharpness appeared solid. A couple of shots demonstrated some slight softness, but those occurred infrequently. Otherwise, the image was tight and well defined. I saw no problems with jagged edges or moiré effects, and edge enhancement caused no concerns. In addition, print flaws appeared absent. I witnessed no signs of specks, grit, or other defects. None of the prior Alien flicks offered vivid colors, and Resurrection followed suit. In general, the movie displayed either mild brown or green tints. Within those parameters, the hues looked accurate and well depicted, but nothing unusually vibrant occurred. Black levels seemed nicely deep and rich, while the film’s many low-light situations came across with fine definition and clarity. Overall, the image of Resurrection appeared concise and distinctive. How did this compare with the original 1999 DVD? Both seemed fairly similar, but the 2003 disc brought a new and slightly improved transfer. The old one demonstrated a few small source flaws and also presented light compression artifacts and some mild edge enhancement at times. Otherwise, the two discs seemed identical. The improvements found here weren’t massive, but they made the 2003 disc the more attractive one. Although bits and pieces of added and extended scenes appeared throughout the movie, you’d be hard-pressed to differentiate new from original. Some stood out due to dodgy effects work; for example, the bug in the alternate opening looked crude. Otherwise, the new sequences melded very smoothly with the original footage. I noticed nothing to make those elements stand out from the theatrical cut. While the 1999 disc included only a Dolby Digital 5.1 soundtrack, this 2003 version added a DTS 5.1 mix as well. To these ears, the pair sounded very similar. As usual, the DTS edition seemed slightly more dynamic and a little more transparent, but not enough improvements occurred for me to differentiate between the two in regard to my grades. As the only truly contemporary soundtrack, I expected Resurrection to sound the best of the bunch, and it did. Though not a showy mix, the soundfield presented a rich and engaging piece. Elements seemed appropriately localized and they blended together smoothly. Panning appeared neat and concise, and all five speakers offered a lot of audio. The front soundstage dominated to a degree, but the surrounds added a good level of unique material. Those elements created a fine sense of atmosphere, and they jumped into the action well during the film’s livelier scenes. I couldn’t identify any “demo” sequences here, but the whole thing was well executed. Of the four Alien DVDs released in 1999, Resurrection easily presented the fewest extras. Happily, the 2003 version greatly expanded on these. One main change: we can now watch either the theatrical rendition or the 2003 extended cut. I already discussed this in the body of the review, but I figured I should mention it as a supplement too. The DVD uses seamless branching to cut between them. In a nice touch, if you watch the alternate version, you’ll find a deleted footage marker that notes all the originally excised material. The words “special edition” show up in the bottom right of the screen when new footage appears. If you select the “special edition” cut, the movie opens with a Jean-Pierre Jeunet introduction. In this 45-second clip, the director explains that he feels content with the theatrical version and considers it to be the “director’s cut”. He notes that he created the modified version to offer something of interest to the fans. Next we find a new audio commentary with director Jean-Pierre Jeunet, editor Herve Schneid, alien effects designers Alec Gillis and Tom Woodruff Jr., visual effects supervisor Pitof, conceptual artist Sylvain Despretz, and actors Ron Perlman, Dominique Pinon, and Leland Orser. A complicated compilation, it sounded like Jeunet, Schneid, and Pinon sit together, while Perlman and Orser appear together. Gillis and Woodruff form another pair, as do Pitof and Despretz. At least that’s what I think – sometime it’s hard to tell, especially since not all of the participants introduce themselves, but that’s the way it appears to me. Whatever the case may be, the group provide a commentary that never achieves greatness but that usually comes across as informative and interesting. The track covers a nice variety of subjects. We get information on the script and changes made to it along with Jeunet’s use of storyboards to plan the shots. We also learn a lot about the creation and execution of the effects, elements changed between the theatrical and special edition cuts, and various notes from the set. A little too much praise appears – Jeunet seems especially prone to express his fondness for different elements – but overall this offers a useful and fairly rich discussion. Note that the content of the commentary varies somewhat dependent on the version of the film you watch. The special edition and theatrical cuts feature a few different elements. Thjs makes sense but becomes slightly frustrating for those of us who want to learn everything we can about the movie, as it means we need to sit through many redundant elements to get new tidbits. If you select the theatrical edition of Alien Resurrection, you’ll get access to deleted scenes. Note that these simply show the alternate sequences from the special edition cut; nothing different than what we find in that version appears in this section. It’s too bad the commentary for those scenes isn’t available as you watch them; that’d solve the problem of the redundant elements. Biggest surprise in “Ashes”: the inclusion of a 1997 comment from Weaver in which she expresses her disdain for the concept of an Aliens Vs. Predator flick. Given that movie comes out in the summer of 2004, I’m surprised the suits at Fox let this one onto the DVD. The next featurette, French Twist: Direction and Design lasts 26 minutes and seven seconds. It includes statements from director Jean-Pierre Jeunet, Gillis, Woodruff, visual effects cinematographer Conrad W. Hall, Badalato, Weaver, conceptual artist Sylvain Despretz, Whedon, costume designer Bob Ringwood, visual effects supervisor Pitof, and cinematographer Darius Khondji. We learn of Jeunet’s recruitment for the flick as well as his befuddlement about why Fox wanted him. We then get notes about his crew and various concepts related to sets and costumes as well as the decision to shoot in Los Angeles. The program becomes somewhat dry at times, but it nonetheless covers the topics in a fairly thorough and informative manner. Under the Skin: Casting and Characterization runs 12 minutes, 43 seconds and features notes from Jeunet, actors Ryder, Weaver, J.E. Freeman, Leland Orser, Ron Perlman, Brad Dourif Kim Flowers, Gary Dourdan and Dominique Pinon. As implied by the title, this discusses how some of the actors got their roles, and we also hear about work on the set with the performers. More than a little “we had a lot of fun!” fluff appears, but we find some nice notes, such as how Jeunet worked with Weaver. After this we get Test Footage: Creatures and Costumes with Optional Commentary. This fills nine minutes, 49 seconds and includes remarks from Alec Gillis. We see early shots of alien eggs, facehuggers, a spitting alien head, Call’s damaged torso, the lil’ alien baby’s facial skin, skull and body for the end of the film, and some other nasty-looking elements. It’s an interesting reel of development material. Gillis offers some notes that narrate what we see and what they attempted to do with the elements. Test Footage Part 2: Hair and Makeup runs four minutes, 39 seconds. We see shots taken of Sigourney Weaver in different looks for Ripley. Most of these focus on her as an almost-developed clone. This provides another nice glimpse of early footage. “Pre-Production” concludes with some “Still Photo Galleries”. Most intriguing is the First Draft Screenplay by Joss Whedon. Much of this text appears in the final film, but a few important exceptions occur, especially during the third act. It offers an interesting read. The Mark Caro Portfolio presents 21 of the artist’s early sketches for various characters. The Art of Resurrection Conceptual Art Gallery breaks into seven areas: “Title Designs” (31), “Ship Designs” (84), “Prop Designs” (52), “Clone Designs” (27), “Costume Designs” (38), “Alien Designs” (27), and “Earth Designs” (five). Finally, Storyboards splits into eight domains: “Experiment on the Auriga” (91), “The Betty Arrives” (69), “Aliens Escape” (196), “Survivors Regroup” (164), “Underwater Ambush” (140), “Ladder Fight” (154), “Queen’s Hive” (78) and “The Newborn” (130). Next we shift to Production and open with a featurette called Death From Below: Underwater Photography. It takes 31 minutes and 35 seconds as it presents comments from Jeunet, Pitof, Khondji, underwater cinematographer Pete Romano, production supervisor Billy Badalato, Gillis, Woodruff, and actors Freeman, Perlman, Pinon, Orser, Weaver, Ryder, Flowers and Dourdan. “Death” obviously focuses on the flick’s big underwater sequence. We get notes about its execution, with an emphasis on the actors’ training and work. We find lots of interesting shots from the set and learn of the various dangers and issues related to the scene. It’s a rich and fairly interesting examination of the piece’s creation. After this we find a featurette called In the Zone: The Basketball Scene. It fills six minutes and 41 seconds and offers information from Hall, Weaver, Pitof, Jeunet, Freeman, Perlman, and Orser. They tell us a little about the set-up for the shot, but mostly we hear of Weaver’s basketball training and her big shot. At times, this feels somewhat fluffy as it lavishes praise on Weaver for actually making the tough basket, but it’s such a fun element of the film and so cool that she did it that I liked “Zone” anyway. The “Production” domain finishes with two more “Still Photo Galleries”. Production Gallery divides into nine areas: “Production Props: Weapons” (seven shots), “Extracting the Queen” (32), “The Betty Arrives” (35), “Aliens Escape” (53), “The Clone Horrors” (12), “Underwater Attack” (34), “The Queen’s Nest” (17), “Falling to Earth” (52), and “On Earth” (five). Within ADI’s Workshop, we find 156 shots of their creations for the film. As we head to the Post-Production area, we launch with a featurette called Genetic Composition: Music. It lasts 13 minutes and eight seconds and presents statements from Jeunet and composer John Frizzell. We briefly hear how the composer got the gig, and he then goes over his themes and general work on the flick, with some emphasis on unusual instrumentation and the use of electronic elements. “Genetic” gives us a reasonably positive examination of the film’s music. The next featurette, Virtual Aliens: Computer Generated Imagery takes nine minutes and 52 seconds as it offers information from Hall, Henry, Pitof, Jeunet, Gillis, Woodruff, and visual effects producer Susan Zwerman. They go over the visual planning process and then discuss the different groups that worked on various CG elements and a few specifics about their creations. It doesn’t offer a lot of depth, as we hear from no one at the various effects houses. Still, it touches on some topics in a moderately useful way. After this we go to A Matter of Scale: Miniature Photography. The 22-minute and 49-second featurette offers comments from Henry, Pitof, Despretz, Khondji, Hall, miniature supervisor Matthew Gratzner, miniature fabricator Ian Hunter, and miniature cinematographer Rich Fichter, They cover subjects like the design of the Auriga and the Betty, the lighting and photography of the ships and matching it to first unit shots, the use of the ENR process and its complications, and other areas. Probably the driest of the various featurettes, this one seems a little slow at times. It does include some useful material, however, and it elaborates on its subjects well. For our final featurette, we discover Critical Juncture: Reactions to the Film. It takes 14 minutes and 26 seconds as it features interviews with Jeunet, Pitof, Orser, Despretz, Romano, Ringwood, Khondji, Gillis, Gratzner, Woodruff, Frizzell, Henry, Giler and Whedon. They go over their personal reactions to Resurrection and speculate where the franchise might go from here. Given the generally negative critical and fan reaction to Resurrection, we don’t hear many criticisms here. Despretz presents some small knocks on it, but most of the participants express their pleasure with it. It seems odd to create a featurette of this sort and mostly ignore the popular consensus. The thoughts about what the participants would like to see from future Alien flicks are fun, though. “Post-Production” concludes with more “Still Photo Galleries”. Visual Effects Gallery gives us 122 shots, most of which show the miniatures created for the flick. Finally, the Special Promotional Shoot offers 31 publicity pictures. In a nice touch, the DVD allows you to watch all the featurettes as one long program. All together, these fill a whopping two hours, 53 minutes, and 46 seconds. It also collects all the artwork and photos into their own respective domains, though those options seem less useful. I enjoyed being able to check out all the featurettes as one long show, but with so many stillframe options, trying to work through them as a gigantic conglomeration seemed awkward and unpleasant. Lots of people hate Alien Resurrection, but I think it presents a generally successful tale. The movie achieves something different and furthers the Alien saga in a satisfying and intriguing manner. The DVD offers very positive picture and audio with a strong set of supplements. I don’t know if anything here will change the minds of the flick’s foes, but for fans and those with open minds, I definitely recommend it. Does the 2003 release merit a repurchase if you own the 1999 DVD? Yes, unless you have no interest in the extended version of the film and also don’t care at all about supplements. If you simply want to watch the theatrical cut, the 1999 disc is generally fine. The audio seems identical for both releases, and though the new one presents slightly improved picture quality, it doesn’t seem remarkably stronger. However, the 2003 disc includes the extended edition of the film plus a surfeit of excellent extras, so I think the vast majority of Resurrection fans will want to get the new release. Footnote: as I write this, the 2003 version of Alien Resurrection appears only in the Alien Quadrilogy boxed set. However, the 2-DVD version will come out on its own in early 2004.